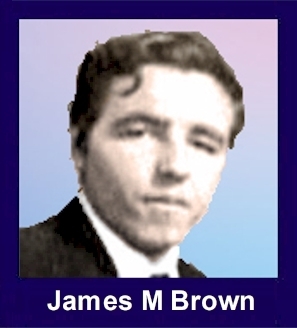 The 35th Infantry Regiment Association salutes our fallen brother, PFC James Michael Brown, who died in the service of his country on March 5th, 1968 in Quang Tin Province, Vietnam. The cause of death was listed as Small Arms. At the time of his death James was 19 years of age. He was from Toledo, Ohio. James is honored on the Vietnam Veterans Memorial at Panel 43E, Line 4. The decorations earned by PFC James Michael Brown include: the Combat Infantryman Badge, the Bronze Star, the Purple Heart, the National Defense Service Medal, the Vietnam Service Medal, the Vietnam Campaign Medal and the Vietnam Cross of Gallantry with Palm Unit Citation. Army Pfc. James Michael Brown, St. Clair Shores, Mich., a Toledo native, was killed in action in Vietnam, his family has been notified. Private Brown was the husband of Rebecca Morris Brown 935 Lindsey Ave. The couple were married in September. Private Brown was born in Toledo and lived here about a year before moving to St. Clair Shores. He enlisted in the army Feb. 2, 1967, and was sent to Vietnam in September. Survivors also include his mother and stepfather, Mr. And Mrs. George Baur, of St. Clair Shores: Father and stepmother, Mr. And Mrs. Robert A. Brown of Toledo; Brother Robert A. Baur, in the army at Ft. Dix, NJ; grandparents, Mr. And Mrs. Robert Brown, of Long Beach, Calif., Mrs. Mary Mellott, of Toledo, Harry Mellott, of Pittsburgh, and Mrs. Gladys Baur, of Mehlville, MO. The body will be returned to the Day-Edwards Mortuary. Services for army Pfc. James Michael Brown, of St. Clair Shores, Mich., a native Toledoan who was killed in action in Vietnam, will be at 1 p.m. Saturday in the Day-Edwards Mortuary, with burial in Woodlawn Cemetery. The body will be in the mortuary after noon Friday. Private Brown was married to Rebecca Morris, of Toledo, in April and was assigned to Vietnam in September.